Day 8 - Didn't do too much today. Just took a well needed day of rest and packed for Paris. 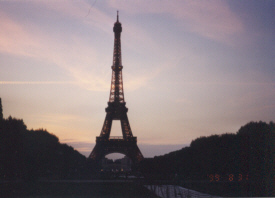 Day 9 - Got up really early today to catch the Eurostar train to Paris. I was not happy being awake so early this morning, but what could I do? The train ride was about 3 hours, so not too bad. But for some reason it felt a lot longer. 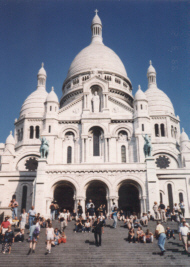 When we arrived in Paris, we had to take the metro to our hotel. It proved to be quite an experience. Some of the doors don't open automatically, you have to push them open. There is also no escalataors or elevators anywhere. So basically you have to walk up a ton of stairs. You can imagine how difficult this might prove with heavy luggage! Anyway, we got to our hotel and had a quick rest and then it was off to cruise the Seine and see the Eiffel Tower. 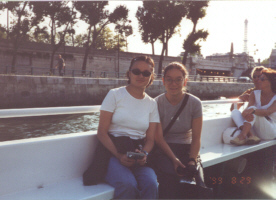 The boat ride was really nice, along the Seine river. Everything was so beautiful, so scenic, so picturesque. I was in awe to be seeing everything that I had only dreamed about. After the boat cruise, we went to the Eiffel Tower. I can not tell you how amazed I was to be seeing this world famous momument up close and in person. There were a ton of tourists there and loads of street vendors waiting to take advantage of those tourists! You had the option of going up to the first, second or third floor of the Eiffel Tower. We decided to just go to the second floor. The view was impressive, although we couldn't see some of the structures that they had pointed out because it was so dark. We ended up climbing down to the first floor and then taking the elevator down. I did not want to leave, but everyone else was tired and hungry. 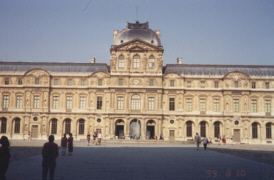 Day 10 - Went to the world famous museum - The Louvre today. It was impressive and spectacular and I know what people mean when they say you can't see the whole thing properly in one day. 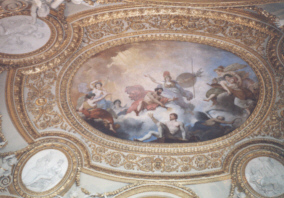 It had these gorgeous ceilings and it was just huge. We saw the famous Aphrodite, Mona Lisa, Napoleon's appartments (which were just grand) and loads of other stuff that I just can't remember. After we went shopping, however did not buy anything as things were so expensive. 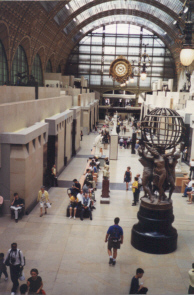 Day 11 - Today we headed off to the Musee D'Orsay, world famous museum which holds paintings by such great artists as Renoir, Degas, DaVinci, Monet. But to be honest I didn't really enjoy myself here as I was so exhausted. Me and my cousin were having problems walking through the whole museum and it's quite tiny! Afterwards we headed off to the Arch de Triomphe, which was really cool. 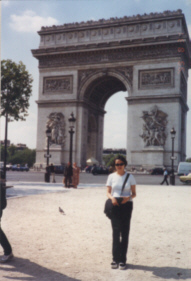 And then we walked down the Champs Elysee, which was really crowded. 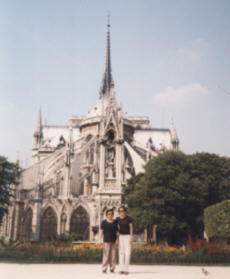 Day 12 - Went to Notre Dame cathedral today. Was so impressive. The rose windows were just beautiful. Afterwards we climbed about 400 sets of stairs or so to get up to the infamous bell. The view was amazing. Then we headed up more stairs to get up all the way to the top. It was quite an experience. A tiring, but fun experience. Going down the stairs proved to be more difficult than climbing up. The stair case is narrow, and tightly spiralled, so I kept feeling dizzy as we were heading down. Looked at a lot of souviner shops afterwards. I didn't really buy anything except a few key chains. Stopped and had a crepe, as everyone says you have to have the crepes in France. 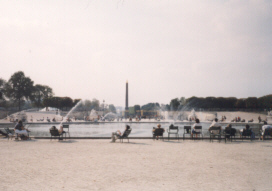 Went to the Place de la Concorde afterwards. It had a nice fountain and obliesque, but not much else. Spent the rest of the afternoon relaxing in the Tulieries. It was such a gorgeous day - warm and sunny. 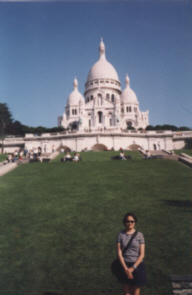 Day 13 - Went to Sacre Coeur today. It was impressive It's on a hill, so you have to climb up these stairs to get to the top and see it properly. Went souviner shopping afterwards. Just bought some Paris key chains. Headed back for London later on that evening. Was sad to leave Paris, but happy to be going back to London. The train ride felt equally as long, but at least this time we were going forwards instead of going backwards. Arrived in London at about midnight and then took the tube back to my cousin's flat. Was so exhausted I fell asleep as soon as my head hit the pillow. 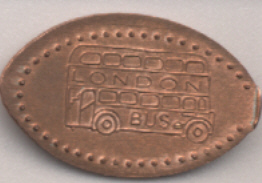 Day 14 - Went to Picadilly Circus today to get a squished penny at the Pepsi Trocadero and to buy a few souviners and things. Went to the Hard Rock Cafe afterwards. We had a hard time finding it, but we did manage to find it in the end and get our t-shirts! Went to Southbank Studios afterwards. We were supposed to meet Becky, but she couldn't make it. So we waited outiside for Ant and Dec. Met some really nice people there. Unfortunately when Ant and Dec were finished rehearsing, they drove right past us on their motorbikes! I was so disappointed, but oh well... you can't say I didn't try! Day 15 - Got up early today and went to Covent Garden. It was such a cute place, with it's piazza and all. It reminded me of the pictures you would see in the books of the cute English towns with the narrow streets and cobblestone roads. There was a really nice marketplace, with vendors selling their arts and crafts. They had a lot of nice things. After we went back to Oxford Street for the last time, as my mom wanted to buy some souviners and I wanted to buy this bag from Kookai that I had kept seeing. Then we headed off to Picadilly Circus for the last time. :( And then it was off to St. Paul's cathedral as mom wanted to go and see what it was like. All the while, I am deeply saddened at the prospect of going home. Day 16 - Got up early to head off to the Gatwick airport. I so did not want to leave. The plane ride was a very long 10 hours, with one stop over in Montreal for only 45 minutes. So what took us so long to get home? I don't know. They showed Notting Hill on the plane ride home. How appropriate. It was fun seeing the Travel Book Shop that I had just visited. I really do like that movie. Arrived back in Toronto at about 5 or 6 pm I think. Dad picked us up at the airport. I was saddened to be back in Toronto. I had just had the best time in England and the prospect of being back here with university starting in a week's time, wasn't too appealing. Anyway, I really had a great time and I can not wait to go back there as soon as I get a chance!